What a long strange trip it's been for John Mayer and his new signature PRS guitar. Starting about a year ago, an image of a prototype first circulated online. Last week, a set of cryptic Instagram posts teased the release. But outside of these few posts, information about the new Strat-like model has been scarce. Many on the scene have been left guessing and waiting for the day when full production details about the new design would be confirmed. Well friends, that day is here, as PRS has just unveiled the full information about the new model, which has been dubbed the "Silver Sky." "The PRS Silver Sky is the result of a close collaboration between Grammy Award-winning musician John Mayer and Paul Reed Smith. More than two and half years in the making, the Silver Sky is a vintage-inspired instrument that is at once familiar but also newly PRS through and through. This model was based off of Mayer and Smith’s favorite elements from 1963 and 1964 vintage instruments, resulting in an idealized version of a vintage single-coil guitar. The attention that was paid to every detail sets this guitar apart." For starters, it appears that Mayer and Smith have paid particular attention to the neck profile on this model, measuring multiple necks from their private collections to arrive at the Silver Sky’s idealized shape. Spec-wise, we're looking at a 22-fret maple neck with rosewood fretboard, bird inlays, a 25.5-inch scale length, and a 7.25-inch fretboard radius. There's a bone nut and what PRS calls its "Acoustic" frets, which are "slightly larger than vintage frets but slightly smaller (in height and width) than what is found on most PRS electrics." The tuners, while vintage-styled, have been tweaked with modern components and a locking mechanism, while the headstock shape is actually an inversion of PRS' normal design, allowing for enhanced access to the first fret. The tremolo system is also vintage-inspired, though specifically tuned to only go down in pitch so that the bridge plate remains in contact with the body when in the rest position. As for pickups, the Silver Sky includes a triple set of newly designed "635JM" pickups, which are also based on vintage specimens and deliver a higher than normal signal-to-noise ratio. 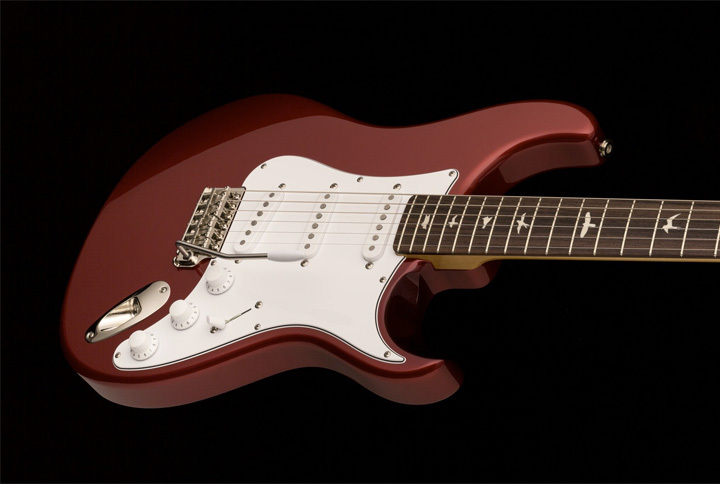 Some may recall that the specific pickups used on the now-discontinued John Mayer Signature Fender Strat were one of the main selling points of that model, and it'll be interesting to see if the 635JM's earn that same renown. The Silver Sky will be available in four finishes: Tungsten, Onyx, Frost, and Horizon, which are shades of silver, black, white, and red, respectively. Built in PRS' Maryland factory, the initial price point for the instrument is set at $2,299 USD, though it stands to reason that an entry-level PRS SE version might be in the cards at some later date. We anticipate a ship-date later in March. Click the following links to pre-order a Silver Sky on Reverb now: in Tungsten, Onyx, Frost, or Horizon.